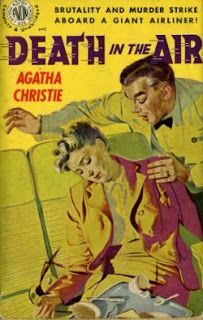 In the spirit of celebrating Agatha Christie’s 125th birthday anniversary,my fellow GAD mystery blogger Curtis Evans proposed recently that some members of our Golden Age of Detection Facebook group should undertake “The Tuesday Club Murders”, which has transmogrified into the Tuesday Night Bloggers. Simply put, we’re going to publish a Christie piece every Tuesday in October. 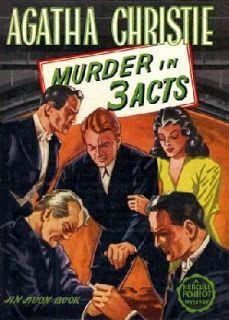 We’ve recently decided to continue with a different Golden Age mystery writer every month; the first three weeks of November will be devoted to Ellery Queen. marketing books as best they could. Sometimes they got it wrong; sometimes they got it hilariously wrong. But sometimes they created beautiful books. 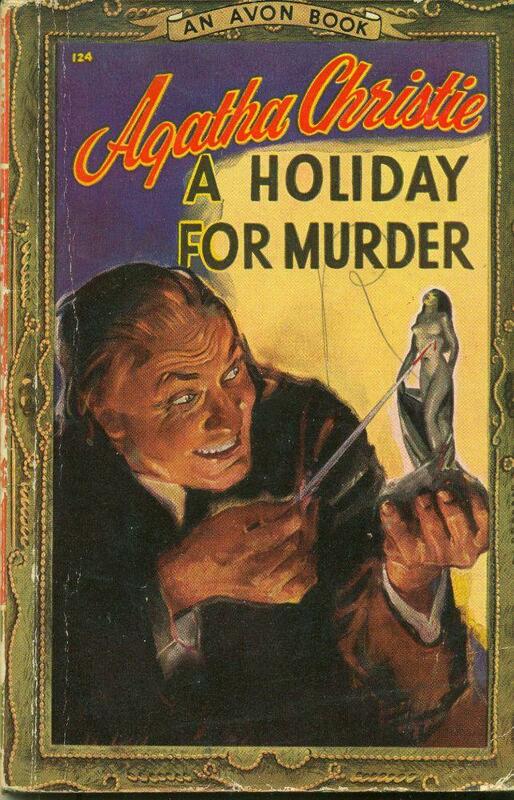 Air and Holiday for Murder nearby); Avon seemed to do a nice job in its early days with skilful illustration with a healthy helping of Good Girl Art (GGA). 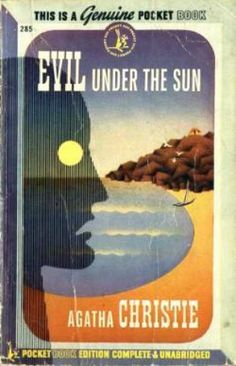 Similarly Pocket had a point in time when they seemed to be linking mysteries with surrealism (see Evil Under the Sun). 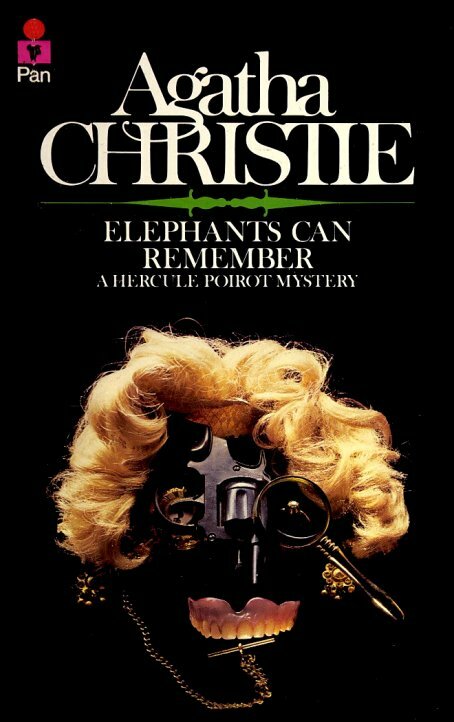 Highly-regarded Christie cover artist Tom Adams also specialized in surrealism and there’s a copy of The Murder at the Vicarage near here that is a riff on a classic Magritte painting. 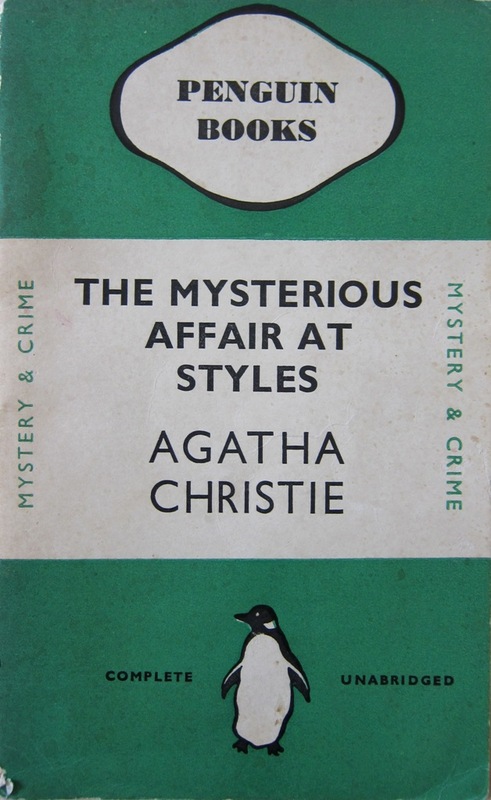 Some people may find it odd that I’ve got a classic Penguin greenback as a favourite — I’ve always thought these were the essence of minimalist chic, and their preferred font of Gill is one of my favourites. 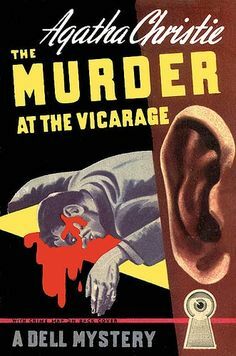 There’s something just so audacious about it, like saying, “Oh, all our books are worth reading; the cover just lets you know that we’ve endorsed yet another title.” The very earliest Penguins come with matching dust jackets and I love that idea too. 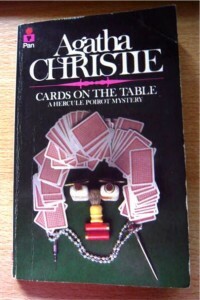 And finally — one of my favourites is the crazy-looking cover for Cards on the Table where a clever artist has created a portrait of Christie herself out of a deck of playing cards and household objects! Perhaps not beautiful but original and challenging. 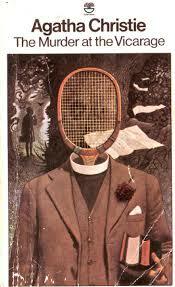 an intention to change literary direction; Halfway House and The Finishing Stroke. 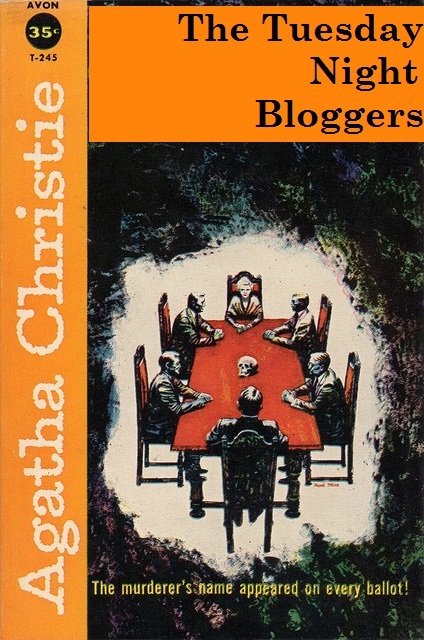 I hope lots of my new readers will be persuaded to continue along! 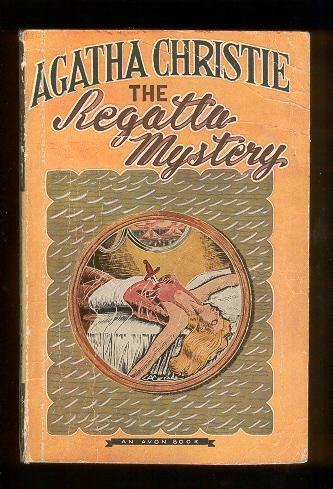 This entry was posted in Detective fiction, Genre fiction, Golden Age of Detective Fiction, Mystery, Novel, Tuesday Night Bloggers and tagged Agatha Christie, Tom Adams. Loved it, Noah! 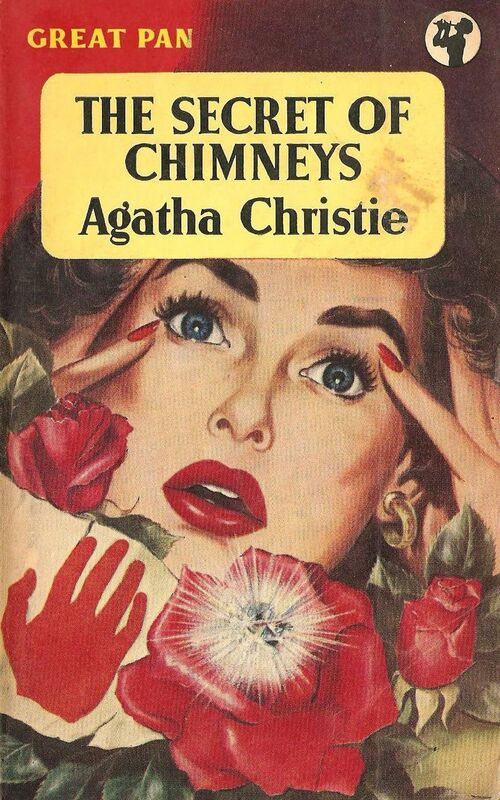 Most of these covers were new to me and all fabulous in their different ways. 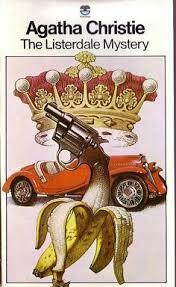 The Quin cover faithfully reproduces a picture described in the book! Wonderful collection. I do understand. I like the audacity of it but … yeah, it’s tacky. Most of these covers I have never even seen. 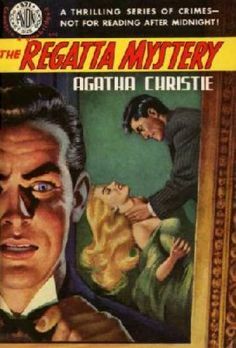 If I were not already trying to get every Rex Stout cover available (paperback not hardback of course) I would become obsessed with Christie covers. That’s an interesting project! There’s an edition of “Where there’s a Will” in the Avon picture-frame editions — worth having because it contains the photographs. 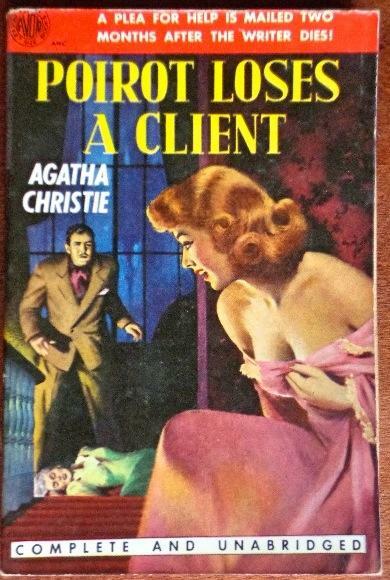 You just pointed out an area where I don’t have many paperback versions. I did check out your post of Dec. 12, 2014. I don’t have any of those covers. What fun, more to look for. Love looking at these, Noah. 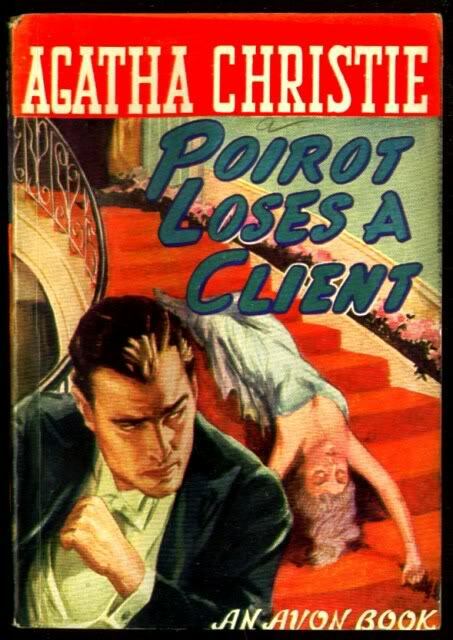 I (as you know) am particularly fond of the Avon and older Pocket book covers. We share that, definitely. I’m also really fond of Popular Library. How lovely these are in their different ways. 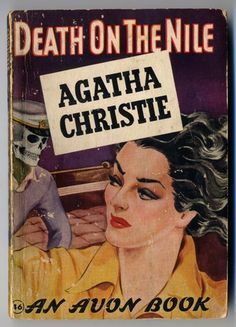 Always loved the tennis racquet one, and very taken with the lower Death on the Nile, with the skull in the sailing cap! Tracy collects skull covers, and Rich at Past Offences likes skulls in hats: they’ll both be after that one. 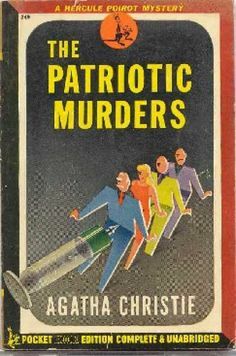 HOWEVER, that Patriotic Murders cover is horrible! 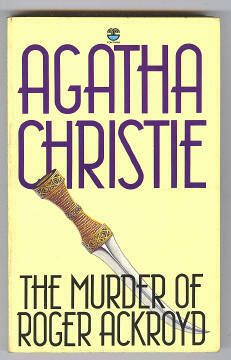 LOL Remember that I find pictures of the body to be appropriate for a murder mystery. 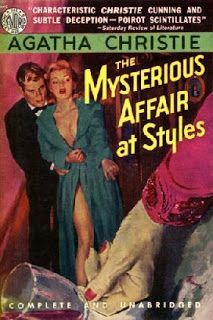 In this case I like it because it’s actually in the book, and someone has gone to a lot of trouble to find those ghastly stockings … But yes, I can’t quarrel with your good taste, it is pretty horrible. 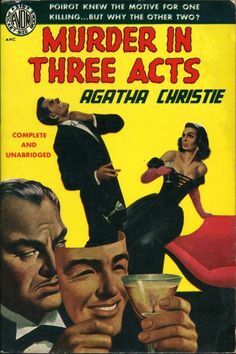 I really like the Pan covers; same series as the Cards on the Table made from a face. 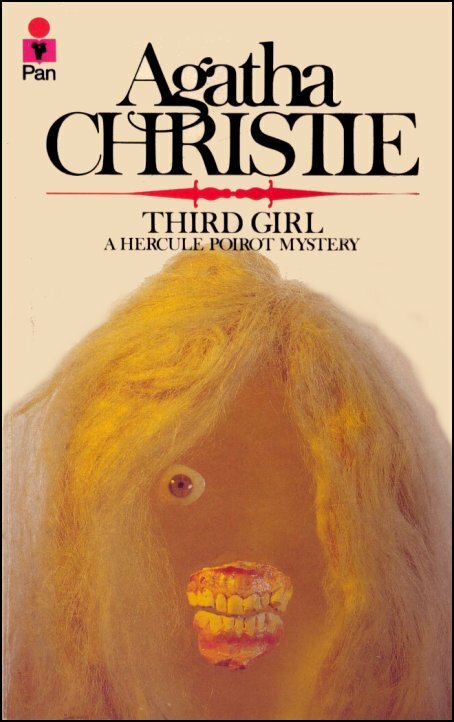 They’re downright creepy; I know a girl who got nightmares from the cover of Third Girl (http://www.tikit.net/2013%20Large/Christie%20Heads/Third%20Girl.jpg), while Elephants Can Remember (http://www.tikit.net/2013%20Large/Christie%20Heads/ElephantsCanRemeber.jpg) is another sinister one. 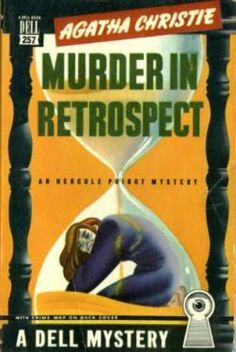 I remember as a kid trying to design covers in a similar style – Murder on the Orient Express, I remember, used a broken watch as the face and matchsticks for a moustache. 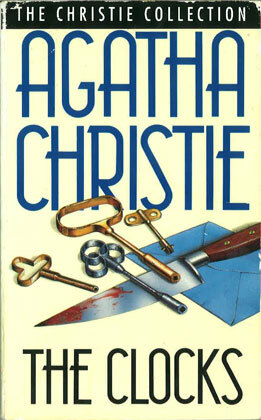 The early Pans are also good – both the photographic ones (your example of One, Two, Buckle My Shoe; there was a good one of 4.50 from Paddington, with the murderer stopping the victim’s hand from pulling the alarm: http://www.detective-fiction.com/4salepix/christie450pb.jpg) and the ones with the yellow banner (https://s-media-cache-ak0.pinimg.com/736x/6f/e1/4f/6fe14fa3e5343558577a1f43373a1aa4.jpg). 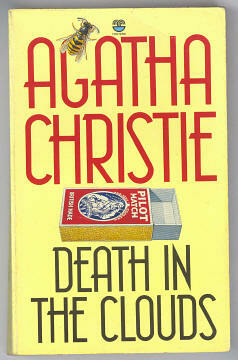 And being old books, they smelt good too! 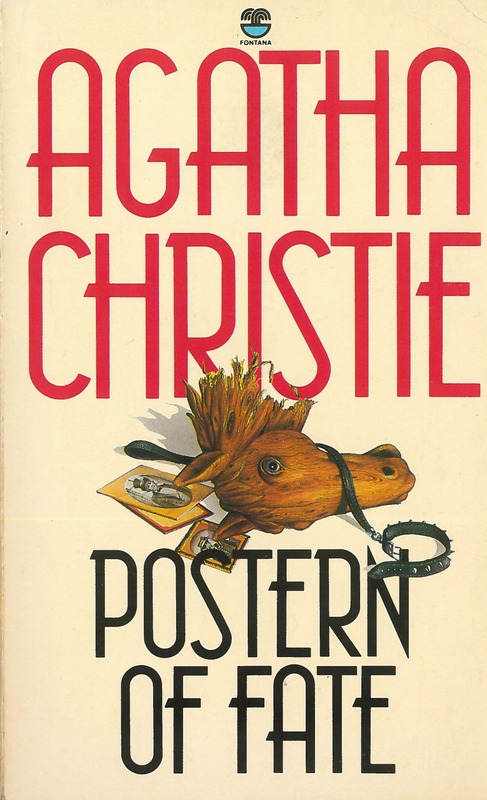 The paperback editions for the last fifteen years have been pretty ghastly, partly due to the font size – should an Agatha Christie novel be 430 pages long? Great post, Noah. 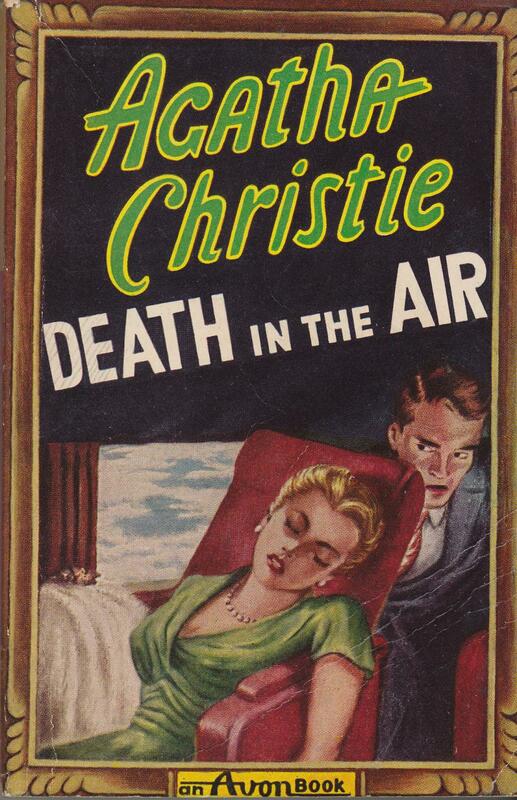 I too am very fond of the early Christie covers I had mostly the Dell ones but the paperbacks themselves slowly fell apart over many years. However I’ve saved many of the covers and plan on creating a poster size collage one of these days. 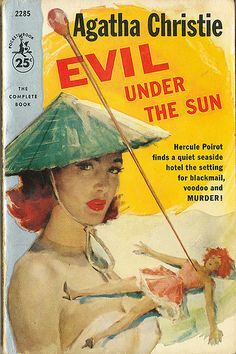 I do like the EVIL UNDER THE SUN one since it actually shows the hat mentioned in the book AND the voodoo thing which was uppermost in t he mind of the young boy who hated his father being being married to Arlena. 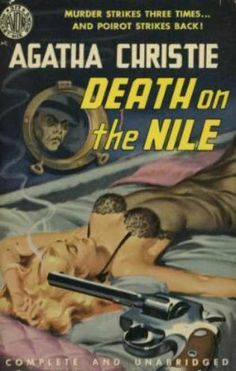 The DEATH ON THE NILE Avon cover always confuses me and makes me think it was meant for AT BERTRAM’S HOTEL. The skeleton in a cap looks like a doorman to me and as we all know, a doorman plays a key role as victim in BERTRAM’S. At any rate, terrific stuff.